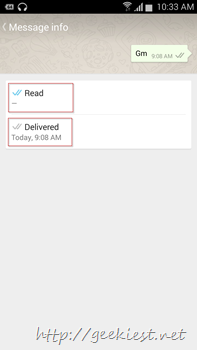 Want to know the read and delivery status of a message you sent to a whatsapp group? want to know who all are read the message ? 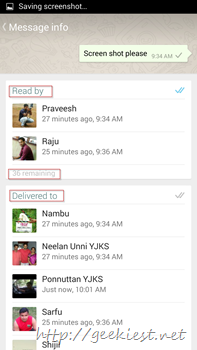 Whatsapp now allows you to check the delivery and read status of your message. This option is available for individual messages and also for the group messages. To check the status of a message long press a message, an ‘I’ icon will be displayed on the top, clicking on it will display the status of your message. If it is a group message it will display who all read the message and to whom all it got delivered etc. This feature is available on Windows Phones and Android phones. The above screenshots are from Android phones. On the Windows phones when you long press on a message , select “info” from the menu. 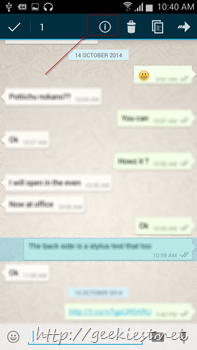 Whatsapp will show blue tick marks to show the read status of your message. If it is a group message the tick will change to blue when all the members of the group read the message.